It may seem that this account of Dualism is out of place here, because traditional wisdom is now thought to be closely allied to monistic mysticism. Those who argue for alternatives to this will be told that they are disputing about a kind of wisdom which has been taught by persons of the highest intelligence and virtue, whom we cannot emulate, let alone surpass. But however true this may be, it is also true that the same observations apply to even greater numbers of those who have taught according to dualistic principles. On this point I part ways with Guénon and Schuon. Their implied belief that such traditional masters as Ramanuja, al-Ghazali, Maimonides, and St. Thomas Aquinas were all incapable of teaching Monism because they lacked the necessary intelligence, knowledge, or sanctity, may be acceptable to some, but to others it seems self-refuting. For the latter, tradition presents us with too wide a range of realities for it to be identifiable with any one metaphysical system. The alternative considered here does not have to be an attempt to claim absoluteness for something which could only be relative, since duality, the archetype of all relativities, cannot itself be one more relativity, which I hope will appear from what follows. Arguably, the duality of soul and God could be an ultimate reality, if it could be shown that mystical self-transcendence was explicable as an internal development in the soul, prompted by its relation to God. Dualistic thought is out of favour today because it is widely felt to have been tried and found wanting, and not only by philosophers, though this may be because the objections to it are taken for granted, rather than thought through. 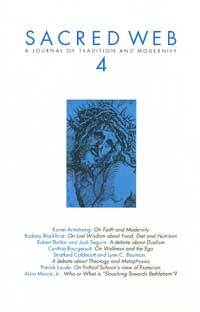 A re-examination of the arguments for Dualism is now overdue, because it seems that the only realistic alternatives to it are those of materialism or monistic pantheism, in fact, Dualism was for this reason the metaphysical basis of Christianity and the other Monotheistic religions, we could not expect them to sustain themselves, if their theoretical basis was rejected. Modern science and monistic mysticism are both equally unable to see that their chosen realities cannot really be independent of the consciousness of the individual. This is why there are profound reasons for the Dualism of God in relation to soul. Secondly, this study should also be worthwhile because of the light Dualism can throw on the nature of the soul and personal identity. More generally still, this form of thought answers to so many realities that alternative explanations can appear forced. To make this clearer, we need to take a look at the present state of the thought opposed to it, and then examine in turn its cosmic relevance, some of the standard arguments for it, and finally its implications for morality, culture, and religion. Dualistic thought is centred on a duality of soul and body which is now unjustly identified with Descartes’ philosophy. This is unfortunate for Dualism, because Descartes adapted this traditional idea in a way which equated the soul with its thought, and made the distinction between it and the body too extreme for their interaction to be understood. The philosophy of this century has been dominated by a reaction against Descartes, which has meant a reaction against Dualism in general, so that it has ended by becoming almost a term of abuse, after having been taken for a reality since very early times. The first question to be considered is: How far is this reaction justified? Indications that it may not be appear, for example, in the way that materialistic and monistic thought enjoy a willing suspension of disbelief that is not afforded to other philosophies; this would imply motives more social and political than philosophical. There is a tacit conviction that the truth must be simple, despite the fact that this belief is not supported either by logical reasoning or by experience. Where this is expressed in anti-Cartesianism, a certain irrationality also appears in the fact that when we attribute the influence of Dualism to Descartes, we are implicitly attributing to him the power of imposing his own peculiar way of thinking on a whole civilisation for three centuries together. In reality, this kind of power is so rare that it is usually considered an attribute of the founders of religions, not of philosophers. Conversely, a more rational line of criticism would suggest that what Descartes really did was to identify a certain element in the way in which human minds have always worked, and create a system around it. Being founded on a universal tendency of the human mind, it would then be sure of acceptance for perfectly natural reasons. This explanation, however, would take away our right to reproach Descartes with the problems raised by Dualism as such. The fault, if fault it was, would have to be with us all. That, however, would be more rational than to attribute supernormal powers to a secular thinker who is believed to be discredited. Because of a widespread desire for unification and thereby simplification, anti-dualist philosophies have become so prevalent that anyone could be forgiven for thinking these philosophies have proved their point and are able to provide a complete and satisfactory account of reality. But this is only an appearance. It has been pointed out by one modern philosopher, Geoffrey Madell, that all attempts to create a working philosophy which would unite everything on the physical level have failed for one reason or another, partly because thought possesses properties such as Intentionality1 and Indexicality2, which seem to be impervious to this kind of treatment. In the same context, another contemporary philosopher, John Searle, refers to the fact that the denial of dualism means in practice a denial of consciousness itself, and that modern philosophers who argue for this are arguing for something which not only most people do not believe, but which they themselves do not believe except, perhaps, in the lecture- room. As he puts it: “We ought to stop saying things that are obviously false,” although Searle himself is not a dualist. (In theory, we could also eliminate dualism from the opposite direction, so to speak, by retaining consciousness and denying the existence of the outside world instead, but that course would meet with more concerted rejection than in the former case, but only for human reasons, not logical ones). According to Searle’s criticism, the denial of consciousness is not sustainable because consciousness cannot be reduced to an appearance of some other phenomenon. It is a special case in which “the appearance is the reality.” It is thus the container and basis of phenomena as such. In this respect it is quite unlike, say, the sensation of heat, or the vibrations of atoms and molecules. The latter are two typical phenomena within consciousness, and so in principle reducible one to the other, as in fact science has shown them to be. Consciousness, on the other hand could only be reduced to something else if that something else was really outside it. This would require us to be conscious of something which consciousness never reached, which would be simply a contradiction. For reasons such as these, a successful non-dualist philosophy remains to this day only an aspiration. In the light of the current situation, then, there need be no fear that a re-examination of Dualism must mean denying an inevitable progress, or disputing anything which was certainly established. One problem with the denial of consciousness is that we must retain all the objects which were taken to be objects of consciousness and explain them in a new way which would be more convincing than that of Dualism. Materialist thought is tied to the assumption that the world and its contents are independent of our knowledge of them, not merely in their essence and origin, but also in the very forms we believe them to have. Such a view of reality is least of all able to confront the question of appearance and reality, since it takes no account of the contribution which our minds make to the outside world as we know it. If Dualism is justified, this would amount to an attempt to retain an effect without its cause or an attribute without its substance, as if the Cheshire cat’s grin really could remain when the cat is gone. I shall try to show later that the form which objective realities have for us owes its character to the way in which consciousness grasps it. Not that the world is created by consciousness, but that much of what makes it recognisable for us is so created. The relationship between consciousness and the objects in the outside world, I shall suggest, may be compared with that between the water in a pond and the ripples on its surface. Thus for all their independence of origin, the objects of consciousness would only be known to us qua modifications of that consciousness. Turning now to the historical background of Dualism, it can be seen that from the earliest times it appeared in cosmological thought, where it had a significance which overflowed the boundaries of the spiritual and the physical. It entered into religion as a belief in opposing gods of light and darkness, like that of Ormuzd and Ahriman in Persian religion, while the duality of body and soul has also been a part of religious thought from very early times, both in Judaism and Christianity, and in other traditions, like that of Egypt. There is a variety of biblical texts referring to this subject, two clear examples of which are: “Look upon all the works of the Most High; they likewise are in pairs, one the opposite of the other.” (Sirach 33, v. 15), and: “And fear not them who only kill the body but cannot kill the soul,” (Mt. 10, v. 28). The duality of soul and body was developed by Plato and Aristotle, through whose thought and its offshoots it has remained current up to modern times, which implies that there must be at least something perennially meaningful about it, whatever problems it may give rise to. Plato and Aristotle were building on an existing tradition for which the dualities, oppositions, and complimentarisms in nature were one of the earliest incentive to speculation. The Pythagorean cosmology interpreted nature in terms of ten pairs of opposites (ten itself being a significant number), as follows: Limit and Unlimited; Odd and Even; Unity and Plurality; Right and Left; Male and Female; Rest and Motion; Straight and Crooked; Light and Darkness; Good and Evil; Square and Oblong. The changes and interactions between these opposites were thought to make up the cosmic process, although there is hardly any limit to the number of other such pairings which seem to enter into the essence of things, eg., Subject and Object; Form and Matter; Body and Soul; Freedom and Necessity; Cause and Effect; Self and Ego; Quality and Quantity; Active and Passive; Substance and Accident; Positive and Negative; Heaven and Earth; Heaven and Hell; Eternity and Time; Life and Death; Love and Hate; Nature and Nurture; Matter and Energy. The fact that the human mind naturally thinks in terms of things in opposing pairs, either member of which evokes the other, is always liable to prompt the question as to whether these dualities are, as such, part of the natural order which we perceive, or whether they result only from the way in which the human mind selects its objects. In answer to this question, we could do worse than refer to the dual way in which the brain is constructed. Our brains consist of two main distinct parts, these being the Cerebrum, the larger part in the upper and front position, and the Cerebellum, the smaller part in the lower rear position. These two parts of the brain are both divided into right-hand and left-hand hemispheres, which serve very different purposes, as is now well known. The left side of the Cerebrum is used for logical and verbal activities, while the right side is for imaginative and intuitive thought. In regard to the body, the right-hand side of the Cerebrum interacts with the left-hand side of the body, both in regard to sensation and in initiating movement. Likewise, its left hemisphere interacts with the right-hand side of the body. In contrast to this, the left and right sides of the Cerebellum interact with the same sides of the body as their own. This means that the left hemisphere of the Cerebellum has to communicate with the right hemisphere of the Cerebrum, and vice-versa, wherever there is an experience on either side of the body which involve both parts of the brain; while the right hemisphere of the Cerebellum must communicate with the left hemisphere of the Cerebrum. These facts about the brain make it look well suited to the role of a duality-generator in a way which apparently supports the notion that the dualities we see in the world reveal more about ourselves than about the world. However, the formation of the brain took place long before human consciousness had any part to play. It took shape under cosmic conditions which had the power to determine the form of the brain in accordance with their own nature. Whether the brain emerged from the natural order by evolution, or whether it was created by God so as to be able to understand and reflect the nature of the universe, the implication is the same: the structure of the brain reflects an objective reality, so that any dualistic tendencies that this gives rise to need not mean a projection upon the world of anything alien to it. If we now look into the workings of nature to find a physical source for the processes which have led to our physical dualities, there is a huge range of relevant phenomena to be considered. To begin with the inner structure of matter, the atom of each chemical element has principal parts which are equal numbers of positively-charged protons and negatively-charged electrons, since all the elements start with the hydrogen atom, which consists of one proton and one electron. Each successive element, as one ascends the Periodic Table, requires the addition of one more electron and one more proton. Every element therefore comprises a group of pairings between positive and negative subatomic particles. The reactions between the elements which form their innumerable compounds are caused by the forces of attraction between the electro-positive and the electro-negative elements, so that their combinations depend on a duality as much as does their inner structure. In the realm of mechanics, the stability of the universe depends on a balance between two classes of force, namely the centrifugal and the centripetal. If either of these were to overcome the other, the universe would either collapse or dissolve, and analogous remarks apply to the rate at which the universe is expanding. Similarly in the living world, it is easy to see that life depends on a balance between vegetable and animal kingdoms, because of their uses of oxygen and carbon dioxide. Most species reproduce sexually, so that each new individual must result from two progenitors, and not one, and so create maximum variety. Given this universal role of duality in the matter and energy of the universe, Dualism would appear to be a human reflection of the cosmic order. This point brings up the question as to how closely integrated must mind and body be thought to be? If their relation was a very close one, our underlying physical dualities could be expected to have an effect on the direction of our thinking. In this case, thought would most likely have an objectively-based dualistic tendency. Conversely, if there were as little connection between mind and body as Descartes seems to think, the form and tendency of thought need not be affected by its cosmic setting. In this case, it may seem that Dualism need be no more than a possible option, but only seemingly. A disjunction between mind and body which was extreme enough to release the mind in this way would be a truly fundamental instance of Dualism. Whether mind and body are closely integrated or not, therefore, Dualism should be equally an issue. Turning now to the philosophical arguments, for which I shall make use of what has been said on this subject by Arthur Lovejoy, it should be noted first that the truth of Dualism does not depend on its having to be absolute. That would in fact be contradictory, since every supposedly absolute dualism is always a relationship within a single system. On the contrary, it requires only that the dual realities be no less real than the principle which transcends their division. Otherwise, if only the transcending unity were real, as Monists think, this unity would be empty and so effective of nothing; it would be an empty notion. Of all the instances of duality, the ones most commonly thought of are those of Subject and Object, and Mind and Matter. As far as common sense is concerned, this distinction remains meaningful, though it is denied by much of modern philosophy. The problems encountered by this philosophy in eliminating mind and consciousness as a reality distinct from the natural order, are suitable grounds for looking again at the reasons why Dualism was taken to be true in the first place. The premise that there is a real world, and that it is accessible to both thought and sensation is still compatible with the idea that much of it is owing to the nature of our minds. The world may be too real to be only a product of our thoughts, while at the same time, it may be that our perceptions of the world are far from giving us the whole truth about it. In other words, it can be shown that the perceived world is in many ways not the same as the known world. When we carelessly say we know something because we have seen or heard it, we are ignoring the fact that much more than sensation had to be involved in this. Recollection, logical deduction, and generalisation always have to be applied. This can be seen from the fact that no one could master the content of a book merely by perception of its pages, however much they may stare at them. In short, we are aware of a certain discontinuity between ourselves and the outside world which he combined action of sensation and our mental faculties can bridge, but without eliminating it. Some aspects of this gap between the material world and our consciousness leave traces which are even physically measurable. Sight and hearing depend on the motion of light and sound waves, both of which travel to us at finite speeds. This opens a gap between our perception of an object and the object in itself. Light from the Moon takes one-and-a-quarter seconds to reach us, and light from the Sun about eight minutes. Light from the stars may take years, which means we could be looking at objects which have ceased to exist since the light we can see left them. But even the tiniest lapse of time between a perception and the source of the perception is enough to show that we are not dealing with the things in themselves. Thus we should not in theory have the right to equate the source of a perception with our sensation of it. Much of what we know and think about concerns things in the past and future. These things are certainly not directly present, but our ability to think about them is not affected by that. We work with mental representations of things so naturally that we usually do not stop to consider that that is in fact what they are. But in the present moment, things must be different, one would think, because in the present there must be a direct connection between our experience and the things experienced, even if they are distanced by the time intervals between them and our awareness of them. However, it is not hard to show that the contents even of the present moment consist to a large extent of recollections of the immediate past and anticipations of the immediate future. Besides, even if we had a purely present experience, it would be by no means as objective as we usually imagine. This appears in the perspective distortion which affects nearly everything we see. Straight railway tracks and the top and bottom edges of walls are seen to converge at their farther ends, even though we know that the objects in question do no such thing. Square and rectangular objects, unless seen centrally from above, are seen as rhombuses or parallelograms. Likewise, circular objects are most often seen as ellipses, and here again, seeing is not believing. We forget this because the distorted figures are mentally translated into rectangles and circles so automatically that this invites comparison with the way in which the upside-down images on our retinas are turned the right way up by the brain. When we move our observation around stationary solid objects, they are seen to change shape, without anyone believing that that is actually happening. Similarly, objects are seen to grow larger as we approach them and grow smaller as we move away from them, which again we disbelieve because mental judgement is substituted for sense. Common sense assures us that our perceptions of things growing larger and smaller is owing to the fact that a pair of light rays from the top and bottom of an object diverge at a wide angle when the eye is close to them, and at only a small angle when it is distant. But the weakness of this well-known geometrical story is that it presupposes the existence of an object of fixed size for the light rays to make different angles with. The existence of things of constant size was what we wanted to prove, whereas this argument needs the conclusion before it can start. For this reason, then, objects of constant size are not a matter of sensory experience. In all these matters, thought over-rules perception, because hardly anyone doubts that the real world is different from what our senses are telling us. Another essential way in which the world we perceive differs from the world we believe to be the real one appears in the continuity with which things are believed to exist. For our senses, all the persons, places and things known to us are continually appearing and disappearing without any necessary rule or regularity, except where we impose a rule on them and on ourselves. No matter how often things appear and disappear for sense perception, we take it for granted that they really exist just as continuously as we do ourselves. Here again our conviction results from a mental judgement on our sense-data. The common sense reason why we do not perceive things really passing into and out of existence is, like the previous example, one of question-begging. It argues that we only see things appear and vanish again because we are transferring our attention and activities from one thing to another, and that our ability to divide our attention is always limited. However, if things were really alternately coming into existence and passing out of it, our attention would be transferred perforce, in any case. This situation is quite literally the case with the images we watch in films and on television. The deception of the eye by films leads us to a similar result as in real life, that is, to our conviction that the objects we perceive exist continuously, and that sense is only giving us fluctuating representations of things which are constant in themselves. This is far from accounting for all the ways in which the perceived world differs from the real world. We also believe that everything in the real world is governed by the natural laws which are investigated by science, despite the fact that none of our normal perceptions presents us with anything of this kind. At first sight, this may seem too sweeping, because an easily-visible natural law is always apparent in the way that the Sun rises in the East and sets in the West every day. I give this example because its real meaning is quite different from what we normally take it to be. The only reason why we see this twenty-four hour law of the Sun’s apparent motion is that we arrange our lives according to the same twenty-four hour cycle. If we got up and went to bed whenever we felt like it and had days of random length, the Sun’s apparent movements would be even more confusing than those of the Moon. If, in fact, we lived according to lunar time (retiring and getting up fifty minutes later every day), the motion of the moon would appear perfectly regular while that of the sun would vary a great deal. These examples illustrate the point that the observation of natural laws is only possible when we set aside all personal motives and interests and subject our activity to the limitations of one particular phenomenon. This is what scientists have to do, of course, and their work thereby consists in excluding relatively unessential things so as to reach the essential ones. That is how many scientists would put it, I think, but the implication is that most human motivations and activities are somehow not fully real; this only is a problem for forms of thought which substitute the abstract for the concrete, however. But if the world of ordinary experience is not seen to be governed by the laws of nature, this does not mean that it has no law at all. In fact it is very much subject to a law, this being that of one’s own will. The will determines what is selected for attention, and for what purposes, and for how long, and its purposes seldom include following through the pattern of a natural law. The will is driven by ends to be achieved as much as by causes in the past, and this teleological property is allowed no place in nature as it is known to science. For this reason, the world of science may never coincide with the whole of reality; it always has to be reached by a subtractive process which eliminates purpose, among other things. Part of the function of sense-perception is to draw a mass of separate things together into a single location, as may be depicted by rays of light meeting at a focal point. In this way, the unrelatedness, separation and mutual exclusion of objects is overcome, and they are transferred to a state where each of them enters into contact with all the others. Here again, we have a way in which the perceived world differs from the objective world: in the physical world, all things are in fact in mutual separation and exclusion, but qua perceived, they are in a state of intercommunication. This form of transcendence is no more than what consciousness requires, and representation is what makes it possible. This has consequences for the form in which the world appears to us. All its scattered contents appear as a structured system with one’s own ego at the centre, with the contents arranged as it were in concentric shells around this centre. This appearance of the world as always revolving around one’s own ego is in fact the price demanded for the ability to take it into consciousness at all. The fact that no one believes that the objective world really revolves round the person who perceives it opens a specially sharp distinction between objective reality and that of representation or appearance. It is impossible to imagine what one’s familiar surroundings would look like if they were not all referred to a single centre of perception, and this shows how much the form of the perceived world is shaped by the consciousness which receives it. Here, then, are some of the basic arguments for the dualistic theory of knowledge, and it now remains to look at their relevance for the idea of the soul, which I will discuss in the traditional way as the non-material and governing principle which is the counterpart of the body. So far, I have tried to show that the Dualist arguments undermine the common sense idea that the world we perceive is a ready-made and self-sustaining reality, by showing how it is distorted and mutilated in the process of being perceived, while at the same time a rectifying process resolves it into what we intuitively believe it must be. These two processes, without which there could be no question of knowing an outside world, cannot be conceived as being parts of that outside world. They are much more readily understood as manifestations of an immaterial activity at the centre of everything, this being the typical activity attributable to the soul. Thus the argument goes that representation commits us to the idea of a Representor, and this is what is normally identified with the soul. There is, however, a prospect of circularity in this argument which needs clarification. In arguments for the idea of the world as a personal representation, it is more than likely that the activity of the soul is being assumed, even though no direct reference is made to it. How far, therefore, and in what way, can the evidence for representation provide an independent support for belief in the soul? It can still be a basis of argument if we admit the possibility of the soul as a working hypothesis from the start, and then examine the way in which the world appears in perception. If this leads to conclusions which account for realities which material things alone do not explain, and a non-material counterpart to the body is appropriate for this, the hypothesis can then be taken to be verified in much the same way as science verifies its hypotheses. Representation rests on the fact that the real world is not as it appears strictly to our senses, and this implies an active power which indirectly gives rise to these differences. The reality of the soul as the true core of our being makes a vital difference to the idea of personal identity, that is, how we answer the question “What am I?” From what can be said about the soul’s role in perception, it can be seen that there is one way in which soul and body are not only complimentary realities, but that each is exactly the inverse of the other. For the common sense idea of identity—based on the body—the “I” or self is one more physical entity among others, and it is wholly contained by a physical world which is made up of other such things. It is a certain kind of organism which runs about on the surface of a certain kind of planet, and therefore relative by definition. Conversely, for the soul, the body and the whole physical world the body belongs to, appear as content. While the body is essentially something contained, the soul is essentially a container of phenomena. Its content is a world-representation which has the body or ego at the centre. This does not mean that the common sense idea of the self as a physical entity is false in itself, only that it is extremely one-sided. The complete “I” or self is indeed this physical entity plus the world-containing and world-representing soul. The world, as it appears from one’s own unique point of view, is in a real sense a part of one’s identity as well, therefore. People are aware that Gilbert Ryle applied the dismissive expression “the ghost in the machine” to the idea of mind or soul as a substantive reality, but we can now see the irrelevance of this remark once the soul is understood as the container of the representations which make up for us the body and its relations with other physical things. An alleged soul which could be contained by the soul, therefore, the true and complete self cannot be a passive item in the flow of natural phenomena. A vital part of its being is in effect the stage upon which this flow of phenomena is represented and privately made known, in a way which is distinctive to the person concerned. The full development of personal identity, which includes the activity of soul, points towards the traditional idea of the self as a microcosm. The idea of the microcosm is that of an epitome of all realities, from the most subtle to the most material, comprised in a separate unity or “little world.” This idea has been revived in recent years in the Anthropic Principle, which seeks to explain our ability to understand everything in the universe on the grounds that all cosmic realities are present to some degree in each human individual. The Monads which Leibniz speaks of are beings of this kind. He does not call them embodied souls or microcosms because for him the soul is a special kind of Monad which has the power of reason. Nevertheless, every Monad contains a representation of the universe, with or without rationality, even if it is of a very low order, as with the consciousness of an insect, for example. Anyone who is unfamiliar with the philosophy of Leibniz, and wishes to understand his idea of the Monad, would do well to bear in mind the properties of soul and world-representation. Leibniz also says that the Monads have no “windows” through which they could communicate with one another, as though each were a separate little world or island universe in a way which excluded all the others. This rather strange-sounding statement highlights an important aspect of the idea of identify which I have just been referring to. Physicallymanifest interaction and communication between individuals is something we are constantly aware of, but this is not the thing Leibniz is denying. If body and soul are, so to speak, the “downstairs” and “upstairs” components of identity respectively, it will appear that all interaction is by means of the body, or of the physical ego to be more exact, but not by means of the soul as such. This is because our physical self or “I” is by definition an object contained within a larger system of other similar beings, whereas the soul, being the container of our representations of the physical world, cannot stand in anything like the same relation to other beings as the physical ego does. This can be seen from the fact that this ego can never be more than a fraction of any relational activity it enters into, (in a one-to-one it is just 50%, etc. ), whereas the whole of this activity is comprised in the soul of each of those who take part in it. There is an essential disproportion between our physical and our psychical ways of relating to the world. The physical is immanent because, along with the body itself, it is in the same category as the things it relates to, while the second is transcendent, because the soul is not in the same category as these objects. The real self consists of both of these realities, the immanent and the transcendent, and it is this transcendent part which Leibniz says has no communication with any other like itself. This may still appear to some people to contradict actual experience, since communication must originate in the transcendent part of the person, even though the body or ego is instrumental for it. Nevertheless, the whole process, from mind through sensible signs and back again, is contained by the soul or Monad. Our thoughts are mostly conditioned by the aspect of communication which strikes both sense and imagination, and that is inevitably the immanent kind. The transcendent position and function of the soul, on the other hand, can only be understood conceptually, since it has nothing that the imagination could depict, which is why it is usually ignored. (Those who ignore this transcendent part of human identity may misunderstand much about human behaviour. What is taken for lack of understanding or of good will, for example, might in fact be simply the effect of something which no one has any power over, a part of the self possibly accessible only to God). Plato’s philosophy is dualistic in regard to the distinction between the realms of Being and of Becoming, and then that of body and soul as a consequence of that. For Plato, the soul possesses the real agency of the person, and it is to it that the body is subject, along with its activities. The soul would be in this case the real man or woman, and the body is their means of expression. The negative view of the body which appears here is not only owing to the fact that the body is perceived to be under the soul’s control, but also to the fact that the senses are never able to bring us any reality which is stable and uniform enough to constitute truth, rather than opinion or more or less educated guesswork. For Plato, the sense-world of the body is a scene of constant confusion in which knowledge can never be arrived at. But unlike the body, the soul can divert its energies away from the world of sense and communicate with the eternal ideas or Forms. As part of the world of Being, the Forms and their relations are both exact and permanent, unlike sensory objects, whence they can be known truly. Such is Plato’s version of the idea of the soul’s transcendence. While it is different, it is still compatible with the view of it which has been discussed already. The idea that the material world is not fully real, because it is in constant change and instability, is complimentary to the idea that what we know of it is only by a personal representation, the adequacy of which can vary a great deal from one person to another. From either point of view, therefore, we could employ Plato’s answer to the delusions of sense, namely, that the most authentic realities are the Forms, which the mind can grasp without any need for representation, and without any interference from physical change and corruption. One consequence of this conception is that comparisons with physical phenomena will be a little use when explanations of the soul’s activities have to be given. For example, there is an Oriental allegory of the soul as a candle-flame which gets passed on from one candle to another. Now if the dualistic conception of the soul is correct, all processes which take place between material things must be equally contained in the soul’s own substance, rather as the projected images of a film are contained in the film itself. This implies a very radical difference between the reality proper to the soul itself and the things known to it, and this is why analogies like that of flames or drops of water in the sea must be far less meaningful than is usually thought, when applied to the development of the soul. What relevance they do have is owing to the part played in our identity by the body, and not by the soul as such. One noteworthy difference between them appears in the fact that, for the physical level of being, the alternatives of staying the same or becoming something else are hard alternatives; it always has to be the one or the other. For soul-life, on the other hand, it is just the opposite, since remaining itself while becoming other things is what it largely consists in; the soul can be said to become what ever it knows. Since real analogies connect only things in similar categories, there can be no reliable analogies between the soul and the things it forms representations of, which are part of its own internal conversation. It now remains to add a little about the implications of dualistic thought for ethics, religion, and the arts. The relation to the soul to its world as just described, affects moral values because it forms an ontological discontinuity between the self or soul and the objects and activities of the world. The transcendent property of the soul could not be confounded with the physical ego and its activities in the outside world without making an impossible combination. Two quite different levels of being would in effect be equated in an illusory manner, and this is what lies at the heart of moral evil; something in the represented world take to have as much or more importance as the self in which it is represented. The illusory sense of self which gives rise to evil can also be said to arise when reasonable desires and dislikes decline into blind compulsions. When this condition is dominant, it gives rise to what could deservedly be called the “cosmic illusion.” The idea of an illusory identification of the self applies to the self in relation to things peripheral to itself or not personal at all, while the self-identifications involved in personal relationships, on the other hand, may or may not fall into this category. The more the relationship is based on shared values, the more free it must be from being apart of the cosmic illusion, because there would then be no question of self-identification with anything of a lower nature than that of the real self. In this connection it is noteworthy that Kant’s moral principle that all persons, including oneself, must be treated as ends and never as means, is in line with the moral consequences of soul and world-representation. The application of dualistic philosophy to the arts is of some interest because it relates directly to the claim that great works of art manifest a greater truth and reality than is possible for most people unaided. If such claims for great art are valid, it will most likely be true that creative artists have a richer and more powerful way of representing reality, and their art will be a means of sharing this greater insight. On the other hand, if the dualist conception of soul and world was mistaken, and we all grasped reality itself all the time, there would presumably be no possibility of anyone having a superior vision or insight. This would certainly be more democratic, and then it would only be possible to say that the artist’s vision was different from that of the majority in ways that were more or less interesting. (Exactly how we could differ about reality in this case, let alone make mistakes about it, is a problem one must leave to the creative talents of anti-dualists). Even the greatest works would be only displays of eccentricity, made with some technical skill, but no more than that; they would simply be forms of entertainment. Finally, it can be seen that the denial of the dualist point of view in today’s culture also means in practice an increased pressure on everyone to see their identity only on the physical level. The physical part of identity is necessarily dwarfed and dominated by the physical world it is part of, and as a result, the meaning and value of the individual person has come to appear increasingly dubious. That, too, has negative consequences for religion, because religious beliefs and moral values presuppose that each person is indeed of ultimate importance. We thus grow more de-potentiated as persons by this new attitude as fast as new powers come from technology. For most of the ordinary purposes of life, the difference between reality and representation can be ignored, because the ends the representations serve are of the same nature as the conditions that give rise to them, where the higher values are not directly involved. Religion, ethics, the arts and sciences, all assume this distinction, but one can engage in them without any conscious use of it, because they all have structures which incorporate this distinction, according to their various criteria. This points to the special purpose of philosophy, for which the difference between appearance and reality is an essential part of its subject matter. Nearly every other kind of activity can be pursued as though world and representation were the same thing, without any obvious illeffects, in the short term, at least. The correction of this situation is the task of philosophy, and Dualism is deeply involved in this activity. 1 Indexicality is a property of things by which they have unique reference to one another, and it appears where statements are said to be “about” something. For example, we may have a scientifically complete description of all the people in this room, without it being able to include such facts as that “this person is me,” and “that one is you,” or that the universe contains an individual such as me and one such as you. Thus indexicality relates to a class of beings none of which can be substituted for others, whereas for science, all entities in a given class are open to substitution. 2 Intentionality applies to the way in which things in the physical world owe their properties to our thoughts and practical purposes. I say that a chunk of glass with a hollow in the middle is an ash tray because of my own tendency to use it for that purpose. Similarly, one collection of people is a party, while another is an auction, but what makes these things what they are is the intentionality of those who go to them, that is, the thought in each mind “this is going to be a party” or “this is going to be an auction.” Without this, the efforts to organize such things would be in vain. Yet in every such case, the only physical reality is just a collection of human beings. A “theory of everything,” as scientists understand it, would therefore not be able to make sense of either Indexicality or Intentionality. 3 Morality and Representation In a standard example of moral wrong like that of stealing, it can be seen that this involves an identification of the self and its wellbeing with an external object, which goes so far as to apparently justify the sacrifice of other peoples’ interests. Even where the thing stolen is felt to be a matter of life and death, the identification of the self with it still cannot be justified on a dualistic basis, because what dies could not include transcendent part of the self which belongs to the soul.